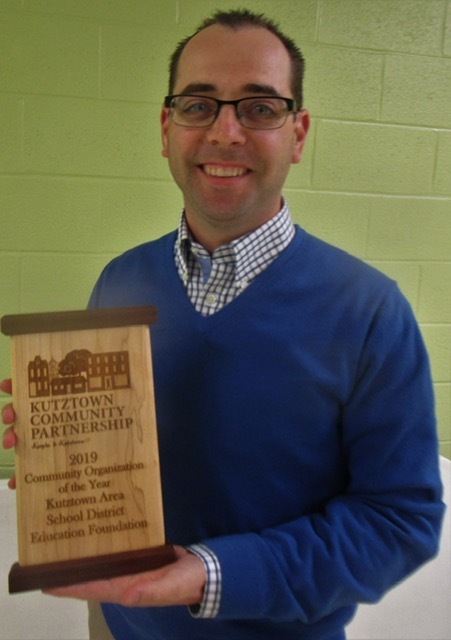 At the Annual Meeting of the Kutztown Community Partnership held on March 12, the Kutztown Area School District Education Foundation was awarded the “Community Organization of the Year” Award. The Kutztown Community Partnership receives nominations each year as they look to highlight an individual volunteer and an organization who go above and beyond to make the community a better place. President of the Partnership, Jerry Shearer, noted the Education Foundation’s promotion of education, strong partnership with the school district, and their primary role in the Cougar Pride Capital Campaign as noteworthy accomplishments, worthy of this recognition. Strunk Media is a Kutztown-based digital development group founded by 2 Kutztown High School alumni, Matthew Strunk and Devin Peterson.